There is no evidence that diversionary conflicts during domestic unrest target traditional enemies. There is no evidence that diversionary conflicts during domestic unrest are aimed at geographically close targets. There is no evidence that diversionary conflicts during domestic unrest are aimed at geopolitical incompatible targets. In the United States context, one cannot view these research findings without making a plausible, direct connection to the current administration and its foreign policy. Since taking office, the approval rating for President Trump has been under 50%, for the last six months it has been consistently under 40%. Adding the investigation on possible collusion between the Trump campaign and Russia to the picture, it is safe to suggest that the current administration is facing severe domestic pressure. Not surprisingly, a Google internet search with the terms “diversionary war” and “Trump” provides more than 1,000 results. More specifically, there are three foreign policy issues, and the ways they are being dealt with, that give credence to the “gambling for resurrection” and “rally around the flag” theories. First, the Trump administration is outspoken in its claim that Iran (a traditional adversary) is willfully violating the terms of the Iran Nuclear Deal. Second, the administration is promoting a hard-fist, military might approach with regard to combating ISIS as the only solution to combat terrorism. Moreover, the terrorism threat is exaggerated to justify these approaches. Third, the ongoing conflict with North Korea (a traditional adversary) has been escalated, leading many experts across the political spectrum to conclude that the administration seeks war with the nuclear armed nation. The Trump administration certainly did not create the conflict with North Korea, yet we can observe how narrative of the threat of nuclear missile attacks on the U.S. mainland is pushed as a menace to the entire population of the U.S. The existing rivalry between the U.S. and the demonized North Koreans—the “other” we should be afraid of—plays into the administration’s narrative and provides a needed diversion from poor performance and low approval ratings. Especially in an era where an unpopular U.S. administration is pushing nationalist sentiment to discriminate against immigrants and “otherness” under the cover of “Make America Great Again”, we must not fail to consider foreign policy saber rattling in the context of “rallying around the flag” and “gambling for resurrection”. At the same time, the results caution us not to assume that these are (sole) explanatory factors. Considering this context, both the “rallying around the flag” and the “gambling for resurrection” theories are intuitively plausible. The author suggests in his review of related research, that diversionary conflict is highly conditional. In other words, the contextual factors that go beyond an embattled leader and diversionary conflict need to be included into the analysis. Wars always have many contributing factors. Diversion from domestic lack of leadership certainly can be one, but we must not fall into the trap of providing simple causal relationships for complex social phenomena. The Risks of Foreign Policy as Political Distraction. By Dominic Tierney for The Guardian. 2017. 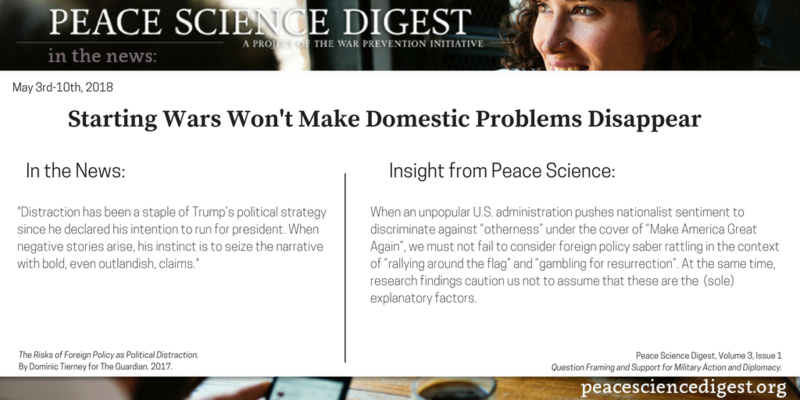 Peace Science Digest, Volume 3, Issue 1: Question Framing and Support for Military Action and Diplomacy.